One of the great things about a trip to Rotorua is that there is an abundance of activities and attractions to keep you busy! However, if you’re feeling a bit intrepid and want to get ‘off the beaten track’ we’ve put together a list of our top local things to do in Rotorua you may not have heard of before. A visit to Rotorua is not complete without checking out some of our geothermal activity. Often people want to know where they can see bubbling mud. Kuirau Park in the centre of town is a great place to see some geothermal activity for free, however my favourite spot to see some bubbling mud in action is this mud pool. Located near Wai-O-Tapu, this geothermal mud pool is an easy 15-minute drive from town and is super impressive! 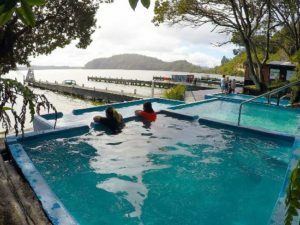 Nestled away on the shores of Lake Rotoiti is the Manupirua Hot Springs. Growing up in Rotorua this was always the perfect way to spend a Sunday afternoon. What makes this place so special is that it is only accessible by boat. Choose from six natural mineral pools of varying temperatures to relax while taking in the stunning views of Lake Rotoiti. Warning when bathing in natural geothermal waters you must never put your head under the water. Book with the awesome team at Kawarau Jet to take you over to the Hot Springs on one of their jet boats! https://www.nzjetboat.co.nz/lake-rotorua-activities/manupirua-hot-springs?slseacat=1911. Tucked away in the middle of an industrial area is the Ciabatta Bakery. Famous for their cronuts (think a croissant mixed with a donut) and Long Dogs, the Ciabatta Bakery offers a range of authentic artisan breads that are baked fresh daily. If you want to dine in, they offer an extensive and yummy range of cabinet foods for lunch. If you’re a coffee lover like me, you must try their banoffee coffee! all ages and abilities. Everything is included, all you need to do is bring your sense of adventure! You will experience 27 locations around town that show the rich cultural and geographical history of how Rotorua came to be. 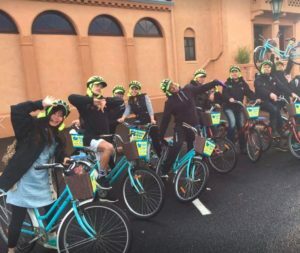 The best part about this tour is that Rotorua is flat, and you are able to go at a leisurely pace without any pesky hills. Our OGO team did this for one of our Christmas parties a couple of years ago and we all had so much fun! Owned by two local dudes, we think the recently opened Paddleboard Rotorua is pretty neat! 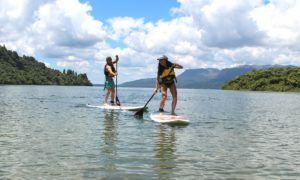 With Paddleboard Rotorua you are able to enjoy the incredible scenery of our Rotorua Lakes from the unique vantage point of being on the weather. All tours are fully guided, and they even provide plenty of gear to keep you warm in the cooler months!